What do you do when you have to pass gas? Let it out and pray that it'll be dead on delivery--no sound or smell? Or perhaps you excuse yourself from the room to duck behind a wall or out on the patio, pretending you've spied a little bird. You could cough, scoot your chair back, abstain permanently from beans. Or perhaps you are astonished, shocked, and have no idea what I'm talking about. You wouldn't be alone in your denial. Seeking etiquette advice for just such a dangerous situation, I turned to Emily Post, whose search engine could find no relevant pages. It seems that neither "flatulence" nor "gas," not "poot," "fart," or even humble "wind" has ever entered her vocabulary or life circumstances. "Unacceptable Noises. Miss Manners does not plan to mention them, chiefly because they are unmentionable, but you all know who you are. What they are. At any rate, there are noises that are acknowledged by neither the noisemaker nor the noise recipient, because socially they do not exist." Yet scientists proclaim that each of us are cutting an average 14 chunks of cheese per day. What should we do? 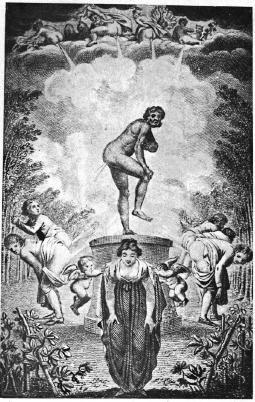 The Egyptians and Romans, at least according to the French, created a mischievous Godling for the recognition and worship of intestinal sounds. Whether truth or satire, he is said to be referred to as Crepitus Ventris, or "noises of the bowels." The word "crepitus" also referred to other sorts of ancient noises--such as strange coughing, the scooting of a chair, or Cicero's fingernails clawing down a blackboard. While it's not impossible that such a deity existed in ancient times (Roman emperor Claudius did consider passing a royal edict to allow gas passing at dinner), this god's probable origin as satire may say more about the way we view the occasional toot. As far back as the 4th Century, (Pseudo) Pope Clement I wrote appallingly of the Egyptians: "others (among the Egyptians) teach that intestinal noise (Latin: crepitus ventris) ought to be regarded as a god." It's the original "You smell!" "This Earle of Oxford [Edward de Vere] making his low obeisance [bow] to Queen Elizabeth, happened to let a Fart, at which he was so abashed and ashamed that he went to Travell, 7 yeares. On his returne the Queen welcomed him home, and sayd, 'My Lord, I had forgot the Fart.'" "The Queen and another chief of state were reviewing troops on horseback when a loud fart came from her direction. She immediately apologized for her horse's having broken wind, and her host graciously brushed it off but then added that had she not mentioned it, he would have actually thought the horse had done it." "It is best when wind passes without noise, but it is better that flatulence should pass even thus than it should be retained." Benjamin Franklin sought freedom even for flatulence, and felt the unpleasant scent was the only reason farting was forbidden. "Were it not for the odiously offensive smell accompanying such escapes, polite people would probably be under no more restraint in discharging such wind in company, than they are in spitting, or in blowing their noses." I'm sorry to say that I haven't yet come across a potion that can do that (Beano might be the closest...). But I did find the portrait work of Hsin-Wei Hsu, who turns farting into art. 79. Great harms have grown, and maladies exceeding, By keeping in a little blast of wind: So Cramps and Dropsies, Colics have their breeding, and Mazèd Brains for want of vent behind. Besides we find in stories worth the reading, A certain Roman Emperor was so kind, Claudius by name, he made a Proclamation, A Scape to be no loss of reputation. Great suppers do the stomach much offend, Sup light if quiet you to sleep intend. Thank you. And to all a good night.